Welcome to the Shire of Mountain Edge! We are a small branch of the Society for Creative Anachronism located in the central region of the Kingdom of An Tir (Pacific Northwest US and part of western Canada), within the Principality of the Summits. Our Shire lands encompass Yamhill County, Oregon, including the cities of Newberg, Dundee, McMinnville, and Sheridan. 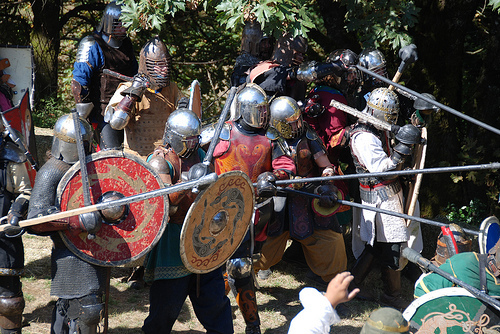 We host three fun and friendly events each year – Mountain Edge Defenders Tourney in the spring and Acorn War in early fall. The Shire also has monthly Council (business) meetings and several types of SCA martial arts practices – the current schedule and directions are on the events page. All are welcome at Mountain Edge activities! Acorn War 28 (2018) was wonderful! Our annual Acorn War was an outdoor camping event held September 21 -23 at Wennerberg Park in Carlton, Oregon. There were interesting war scenarios, art and science classes and contests, a “village center” for merchants, archery and thrown weapons. The Shire Council hold business meetings once a month on Friday evenings. The location alternates between our McMinnville and Newberg meeting rooms. 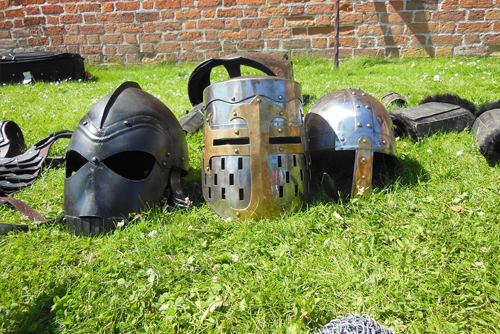 Each spring the Heavy Armored and Rapier Defenders are chosen at a one day indoor event that also has tables available for Arts and Sciences projects and period games. Spontaneous bardic (music) and dancing add to the fun. Our defenders do us all proud and everyone in the Shire is eligible to participate in the Tourney! Mountain Edge holds regular meetings and practices for martial, equestrian, and other activities. Come down and join us today! Fight Practices are Wednesday evenings in Yamhill.